It is 1839, and in British India, there are fortunes to be made by exporting Indian opium to China. But tensions are mounting as the Chinese Emperor realises the damage that the drug is doing to the population. With hostilities mounting, the colonial government declares war, and British ships start sailing east from Bengal into the middle of the first Opium War. The Hind is one of the vessels requisitioned, and aboard are a motley group of travellers. Kesri Singh, a sepoy in the East India Company, leading his men, Zachary Reid, a young American sailor in search of wealth and his lost love and Shireen Modi, a widow risking her reputation to travel to China alone to find the truth about her husband’s death and recover his possessions. On the voyage, connections are come to light, and the travellers’ pasts are revealed to be as tangled together as their futures. 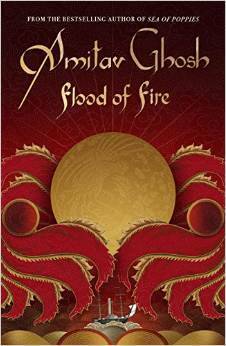 This is the third of Amitav Ghosh’s Booker nominated Ibis trilogy set in India and China before and during the Opium Wars, and it is as enthralling and all-consuming as the first two novels.